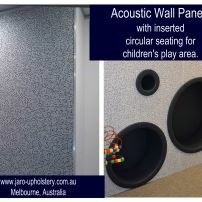 commented on "Acoustic Wall Panels"
This children's waiting room features acoustic wall panels and circular seating installed by JARO Upholstery. Wall panels can be either installed as a decorative or acoustic application. Talk to JARO about your requirements and ideas!